Canada's former poet laureate looks back at a life lived in literature and hockey fandom Hockey forms the backdrop of our lives. For many Canadians, the big moments - births, deaths, marriages, moves - are all mixed up with the wins and losses of our teams. The voices of Hockey Night in Canada sportscasters are our soundtrack, and visions of skates scraping across the ice lull us to sleep. George Bowering, Canada's former poet laureate, is no different. Growing up in Oliver, BC, Bowering was entranced by the kids from Saskatchewan who skated and handled pucks as easy as breathing. His fascination with hockey followed him into adult life, from BC to Quebec and back again. Bowering followed his teams with a critical eye and a fan's passion, and his stories bring us on a cross-country hockey-themed road trip, with occasional forays into boxing, poetry, and sports fashion. Bowering has an encyclopedic knowledge of his subject. He has been an avid and attentive hockey fan since boyhood, and has an extensive catalogue of thoughts and opinions on the personalities and events that populate Canadian hockey history. 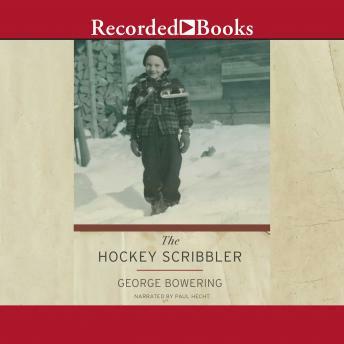 In The Hockey Scribbler, Bowering brings us along on his richly detailed look back at the hockey in Canada since the 1950s.